This bracelet is cast in the highest quality 95% silver. It consists of linked snap swivels which are a staple element of modern day fishing. It represents us as Fishers of Men or Fishers of Souls. We, as God's children, are all spiritually connected like links in an eternal chain with God flowing through the entire chain, electrifying our souls. 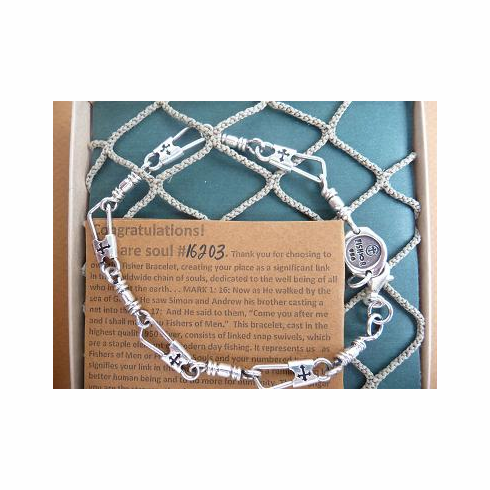 Your numbered bracelet symbolizes your link in the chain. It is a reminder to reach out to our brothers and sisters and to keep them connected... to be better human beings and to do more for humanity. The stronger you are, the stronger the chain. All the materials used are bio-degradable. The box, as well as the net and paper used in the box, is recycled and the bracelet, being a precious metal, is the ultimate recyclable. COMPARE OUR PRICE TO A MAJOR RETAILER'S. THIS IS A GREAT DEAL!